This brief history is counterpart to the short tour known as ‘Eynsham Unlocked’. For more detailed studies please consult the Eynsham Record. We also have a growing Image Archive. Eynsham's first inhabitants probably chose to settle here because of its position on the gravel terrace above the River Thames, where it was relatively easy to ford. A Bronze Age enclosure ditch, over 3,000 years old, was found under the site of the abbey. There is evidence of occupation in the Roman period too. 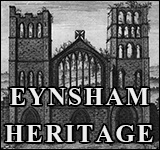 The first documented reference to Eynsham was in the Anglo-Saxon Chronicle for 571. Eynsham Abbey was, in its time, one of the most important in the country. Founded in 1005 by Aethelmar, Earl of Cornwall, the abbey was part of the Benedictine order. Its first abbot was the famous scholar Aelfric, perhaps best known for his ability to take difficult Latin texts and make them understandable to the less well educated monks. The abbey became wealthy, owning land throughout Oxfordshire and beyond. Eynsham became a market town with a regular Sunday market controlled by the abbot. The first licence was granted in about 1150 by King Stephen. Later, Henry II also allowed Eynsham two fairs - at Pentecost and on 15 August. In the 1200s Abbot Adam attempted to increase the abbey's wealth through property development. He created fishponds to the south of the abbey and a new borough called Terra Nova, or New Land, to the north. Adam hoped to move the market here and attract rich merchants to Eynsham. Sadly, whatever his merits as an abbot, he was no good as a businessman: he plunged the abbey into debt and was eventually deposed by the bishop. But his legacy lives on: the road is still called Newland Street and is one of Eynsham's most picturesque streets. With the dissolution of the monasteries under Henry VIII, the abbey was handed over to the king in December 1538 and the magnificent buildings gradually fell into decay. The stones were raided to build many of the village houses. By 1657, only the ruined west end was still standing. Carved fragments of stone from the abbey can still be seen in many of the buildings in the village. The Thames provided Eynsham with a trade route from as early as 1302. From the middle ages to the mid-19th century Eynsham wharf was an important connection to Oxford and London, sending and receiving goods such as coal, corn, salt and stone. Much of the stone used to build the Oxford colleges was shipped through Eynsham. The crossing of the river Thames at Swinford could be hazardous - John Wesley nearly drowned in 1764 - so the Earl of Abingdon built Swinford toll bridge, which opened in 1769. The earl and his successors were granted the tolls tax-free, for ever. With the coming of the mail coach, then the car, Eynsham became an important staging post on the route from London to South Wales (the story of Eynsham inns is recorded separately.) The toll is still collected - 5 pence from every car that crosses the river. In 1861, the railway came to Eynsham, with the construction of a railway line to Witney. The station closed to passengers in 1962 and the line ceased operation in 1970. 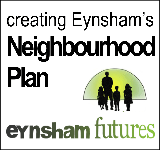 Today Eynsham is a thriving community, with over 4,500 residents and around 2,000 people working here each day. 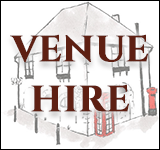 Since the end of the 1940s the village has expanded rapidly with new housing and conversions, secondary and junior schools and, more recently, new facilities such as the Village Hall, Scout Hall and Sports Centre. But Eynsham still retains its individual charm and character - not to mention much of its ancient heritage, with many 16th and 17th century buildings clustered around its historic centre. 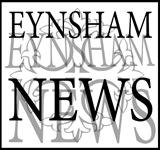 Above all, Eynsham has never lost its strong sense of community. It is not a museum piece, but a living, vibrant village. With a range of shops, businesses and leisure facilities, Eynsham remains what it has always been: a traditional Oxfordshire village - rooted in history, yet looking to the future; proud of its past and flourishing in the present.